November is all about getting the Christmas quilts for clients done. It is also about making an earnest effort to get my 2015 show quilts finished. Both of these tasks are keeping me busy, despite having quite a few school closure/holidays this month. My kids are older, and can manage to entertain themselves some of the time. But as the temperatures are dropping (and those flakes start to fly) they don't want to be outside nearly as much. It is hard to sew in the basement with the pitter-pat of 6 feet overhead. Here's a rather poor (sorry) pic of a recent client quilt. 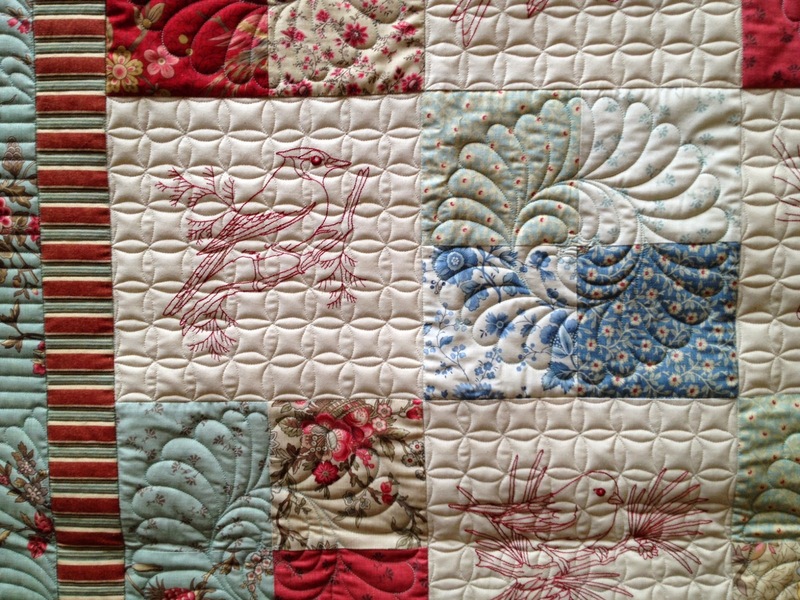 It is actually a lovely machine appliqued redwork quilt of birds I wanted to keep it traditional, so the blank 4-patches are quilted with feathered wreaths. These are free-hand quilted, so there are naturally some anomalies between each block. The redwork blocks are always a quandary as to how to quilt them. Sometimes I outline embroideries and backfill the background, but because these are machine appliqued, there is a LOT of detail...too much to stitch around. I decided upon the pumpkin seed rather than my second choice (cross-hatch). It makes the birds blur in the photos, but they look fine in reality. This shows the birds a little better. 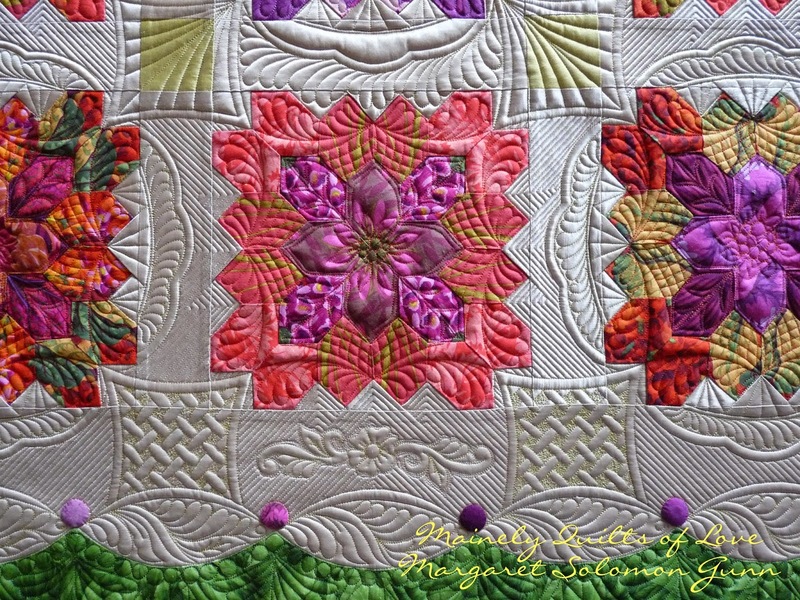 The border is simple, but pretty, and ties into the blocks with the feathered wreaths nicely. I like this line of fabrics - they are really pretty in person. Don't hold me to it, but I think that they are French General (or something like that). 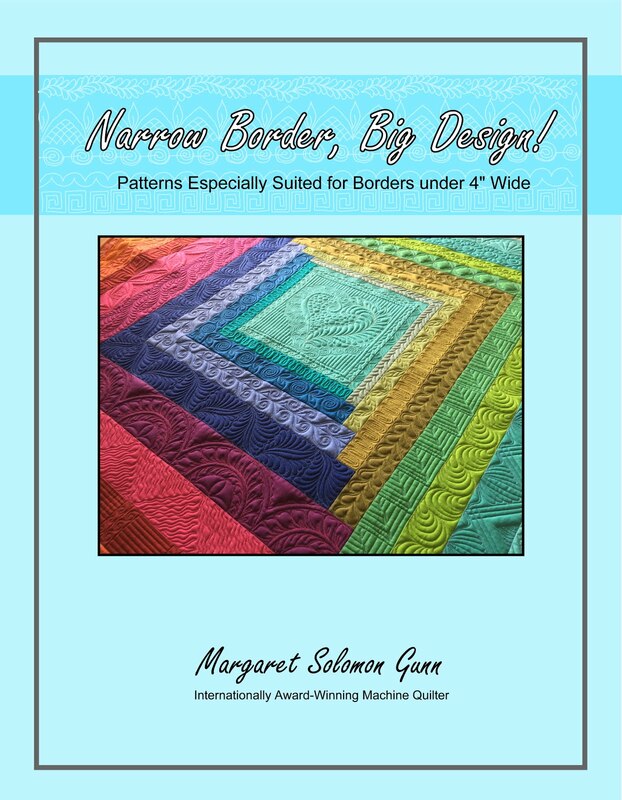 Right now, I have moved onto three edge-to-edge quilts. 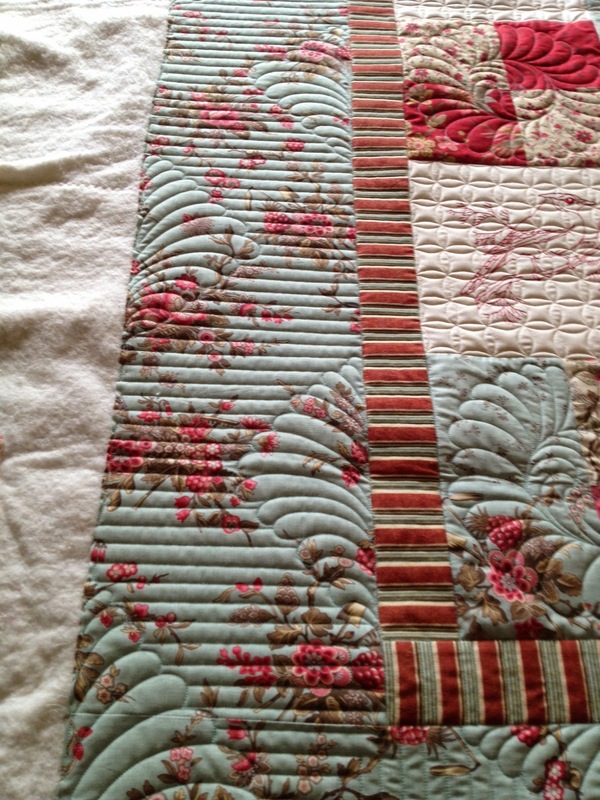 It is so refreshing to do edge-to-edges when so much of my quilting is full custom. It is always that double edged sword - the customs are where I learn techniques and improve my skills, but they are harder on the eyes, back and body. I need a nice mix of both. I spent a couple days last week working on one of my next show quilts. 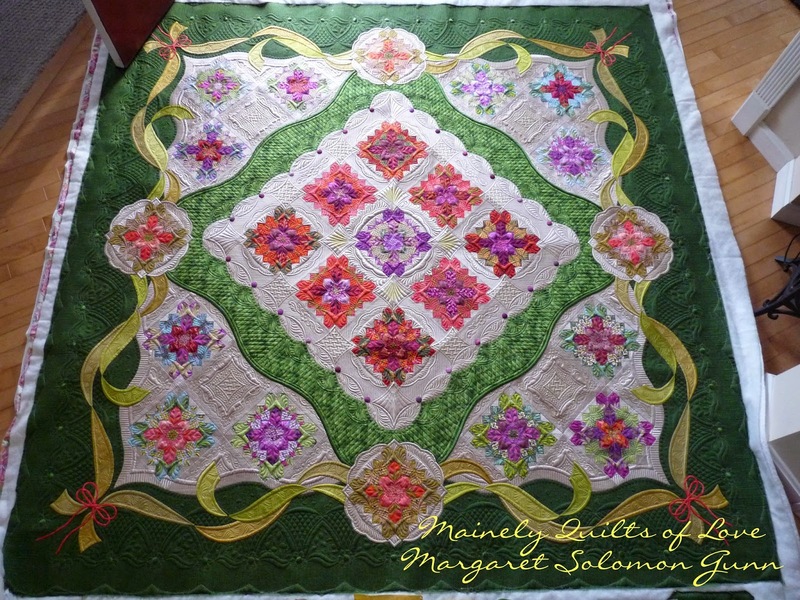 It's only a 40"x40", and still needs some "fixit" work, but most of the unquilted areas are now joyfully quilted! That's a great feeling. The quilting is very busy, but I am good with that. 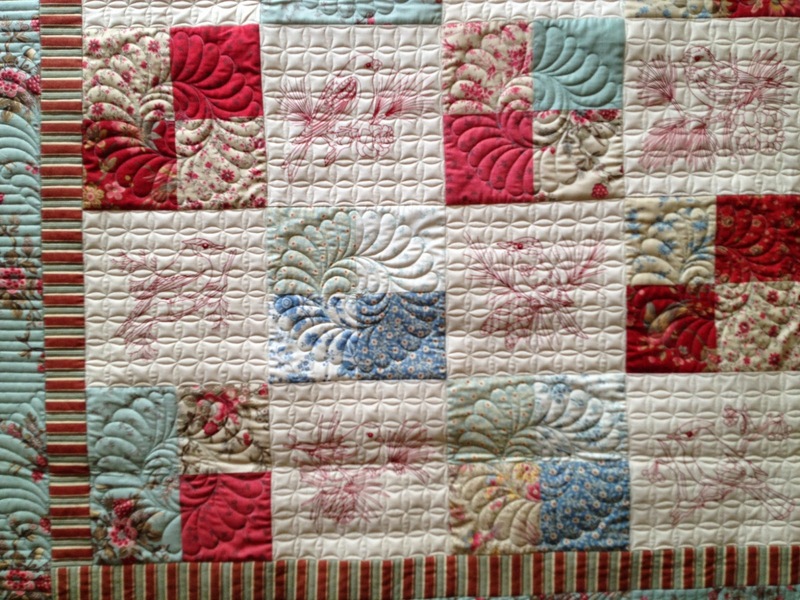 The design of the quilting has altered the look of the original top (scroll to the bottom of this post for a before pic). I also plan to add a good bit of bling. I have held off adding crystals to most recent quilts, but this one is screaming for some. I have one more bit of great news...actually a picture of the cover came to me while I was at Houston. On the first day I was home, this arrived in my mailbox! 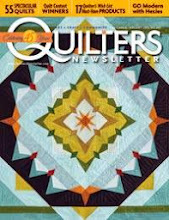 I am tickled to have Autumn's Surrender on the cover of Quilter's Newsletter's next edition. The article my editor wrote is great. 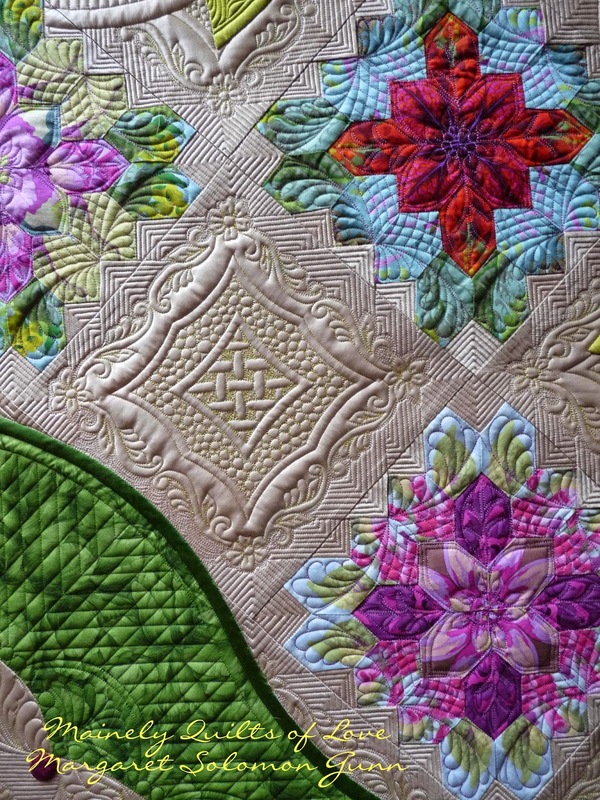 She did a fantastic job including several detail photos of this quilt (which really show all quilting details too! 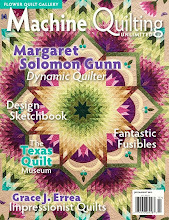 ), as well as nice text about the quilt. 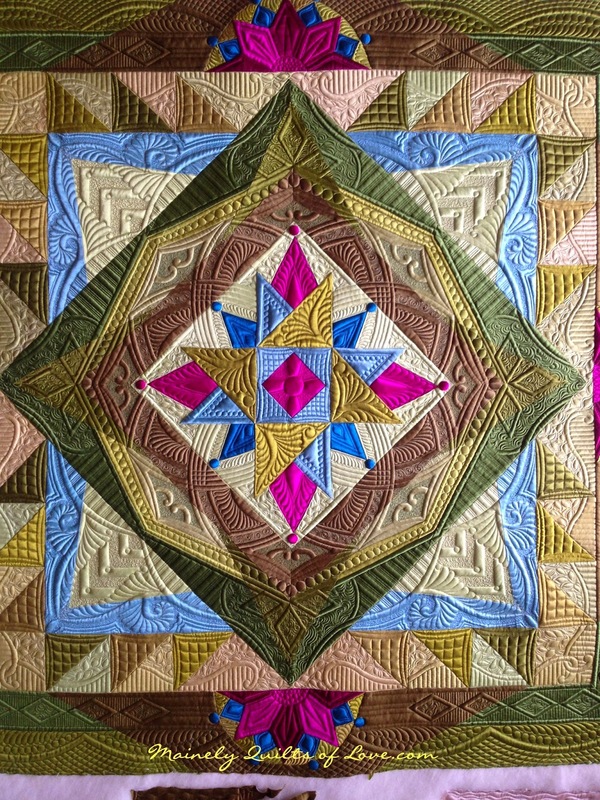 The 2014 International Quilt Festival (aka Houston) is finishing up this weekend. I flew home yesterday. It is astronomically expensive to stay there too long. Plus it coincides with Halloween every year. My daughter didn't appreciate my absence last year, so this year I came home. Next year, Halloween is a day later, so who knows. Really, though, a couple days at the show is plenty. I arrived Monday evening. 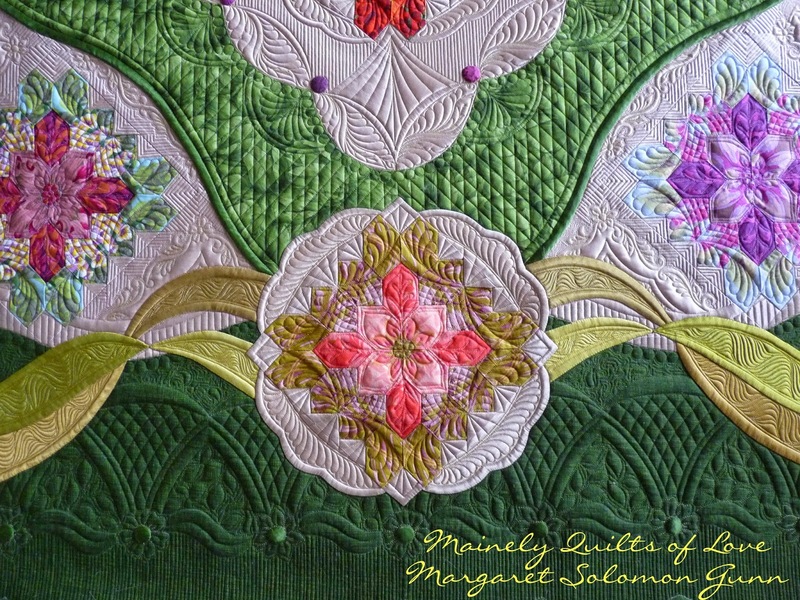 On Tuesday, I took an all-day class on machine applique with Sue Nickel (surely you know who Sue is...she and her sister Pat Holly have made several award winning quilts). The class had good content, but really did not leave nearly enough time on the machines to practice. Heaven knows I don't have time to practice now that I am home, but maybe. Monday evening was the awards Winner's Circle. It is a rather elaborate ceremony where each ribbon winner is called to the stage. 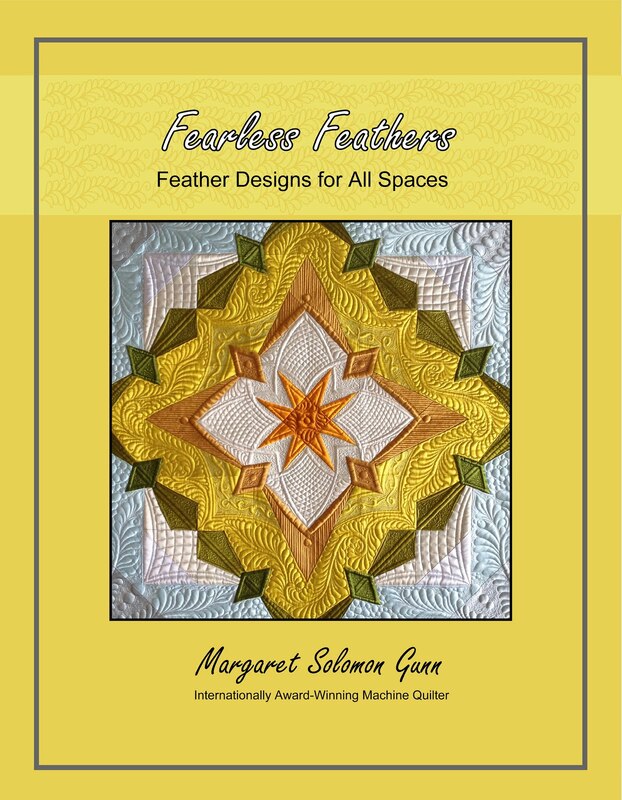 If you receive a first or one of the top 8 awards, then your quilt will be revealed around the boundary of the ballroom for people to look at after the ceremony. I was truly hoping for a nice placement ribbon for the Geisha's Garden. This is like my favorite quilt right now, and I remember all the thought that went into it's details. Right off the bat...first award given was the judge's choice and it went to the Geisha's Garden. It's not entirely what I was hoping for (hoping that this doesn't sound sour), but that is life. Many enter with hopes of a ribbon and don't get that. We were about 1/3 of the way through the awards, when I realized that my quilt was hanging there though! This made my day. I was able to talk to people afterwards, and discuss things I did and why. The judge Marti Michell gave the award. She really loved the quilt. She's a really nice woman; I had a light dinner after the ceremony with her and a couple others. Sad though, is that she told me that it would have taken a high award in its category but the "judges" thought that the white was too white. WTF?!? it is a creamy ivory and in all honesty, I can't imagine it any other color. Gracious for the award?...yes. But that doesn't change the fact that I think this particular quilt show is overly, if not excessively obsessed with things that don't pertain to the quality of the quilt's construction. I received that type comment last year and it is, plain and simple, wrong. Winners should be chosen because they are technically more correctly made. Rant done, for now. The next evening was the preview. It was nice to see quilts without it being overly crowded. I spent most of my time standing near each of my quilts talking to the many people. 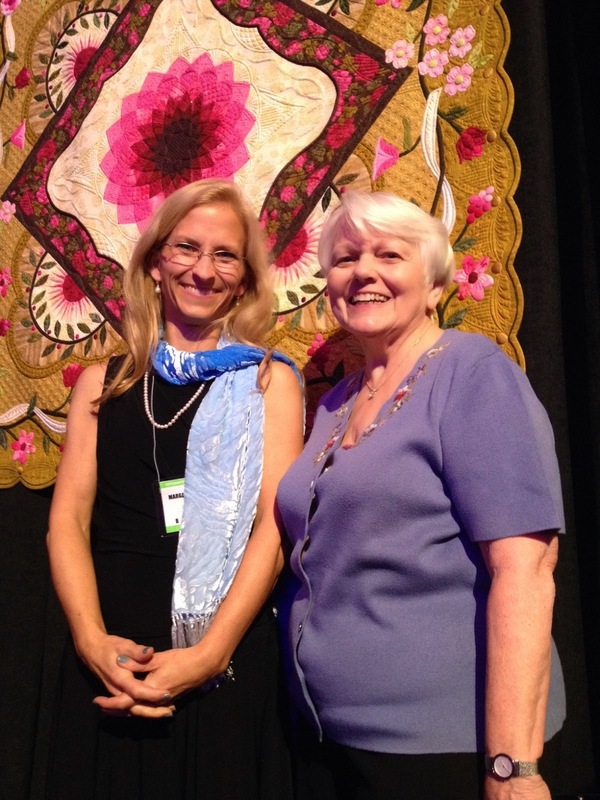 Some knew me from seeing other quilts at AQS shows, while I got to meet many that know and read my blog. That is cool because some days I feel like I have about three readers! Thanks!! This is my other quilt at the show - Autumn's Surrender. It is in the Merit Machine category. It is only one of a couple pieced quilts in this "sea of white wholecloths" category! It won a 3rd place. Seriously, IQF, the ribbons shouldn't be so small. This is Houston, afterall. Make us feel like we won a ribbon in the most prestigious quilt show in the world. 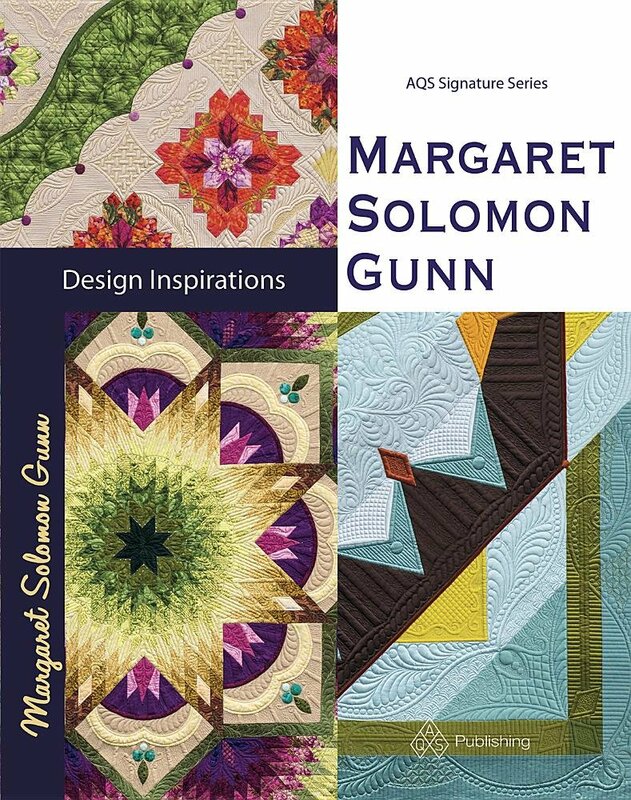 They just love to taunt and mock AQS with the fact that their winners get to "keep their quilts", but do they realize that a 3rd at any AQS show wins a mere $750 (more than twice my 3rd place award) and a big ribbon, the same size as the 1st and 2nd. This year marks IQF's 40th annivarsary - they are calling the show the Ruby Jubilee. They have copied the red and white exhibit that was in NY a few years ago. This display of modern-day red and white quilts is very cool. Beside it is an exhibit of miniature red and whites. It's a beautiful exhibit, very appropriate. Here's a closeup...Cool to see all plates assembed together. While I do have WAY too many pictures to post here, I will try to show some of what was here. Most of these are from the competition. I think that these are from the abstract wall (?) category. Seriously, there are WAY too many abstract, and animal and whimsical type categories to keep track of them. What was interesting was one, the variety, but two, that sun quilt is made from something like 1000 1" circles, fused to the background - only 8 shades of orange and red to make that. This quilt was made by one of last year's winners. Honestly, their's all look very similar...Asian kids and that same dog, but what is most cool are the bubbles. Look closely at the bubble...all raw edge fused (and you do know how I feel about raw-edge! ), but check out the colors used to make them so life-like. Very cool. This quilt of mine hung at one end of the row. It was a nice spot. Here's a peek at some from the hand-made category. Do you sense a Japanese influence??! Their handwork is amazing. Lots of taupe. IMHO, this was the best animal quilt, but it didn't ribbon at all. It is by Ferret, if you know who she is. It is wonderful. 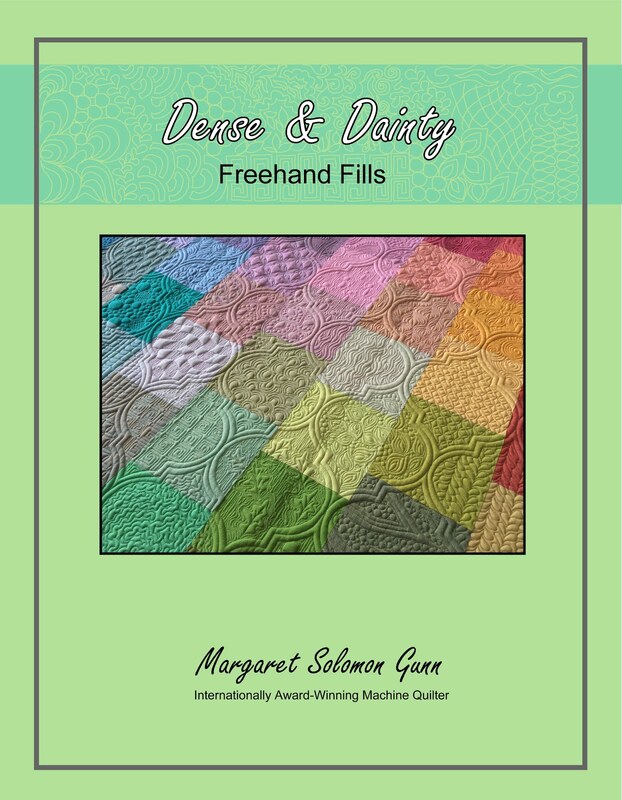 Sadly, it did seem to be a trend that great quilts went unadorned, and others that make you furrow your brow received very top awards. Overall, the top award-winners seemed better chosen this year as compared to last year, but there were still some that made you go "huh". Ferret's wolf is amazing. 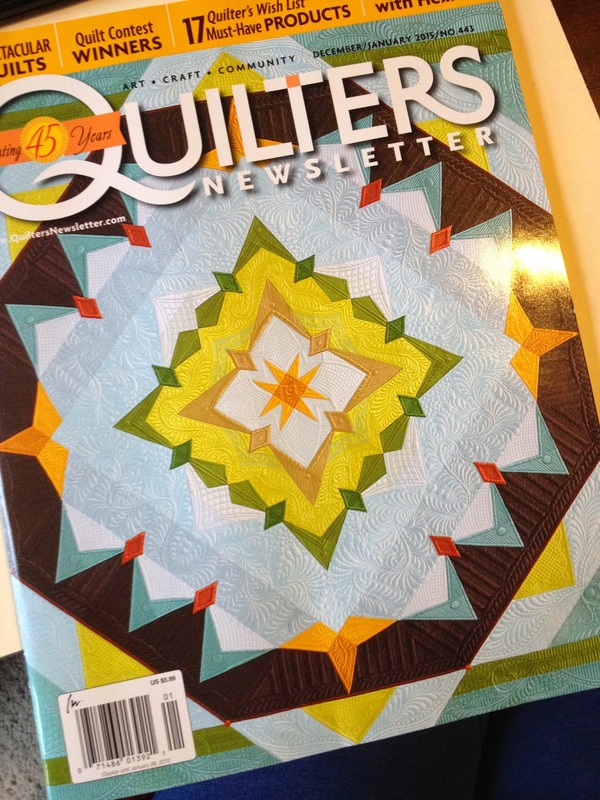 This next quilt took a top $5000 award. 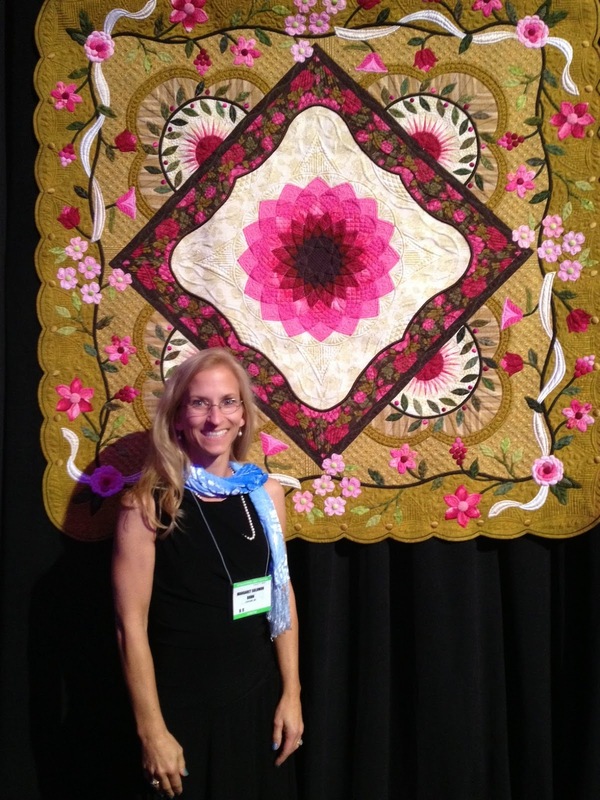 My friend Andrea had 2 quilts in the show...both very beautiful and well constructed. She did not get a ribbon on either. Point proven. It just makes you wonder what the judges (and they are all non-NQA certified) are truly looking for. Her hand painted, then appliqued silk flowers are exquisite. 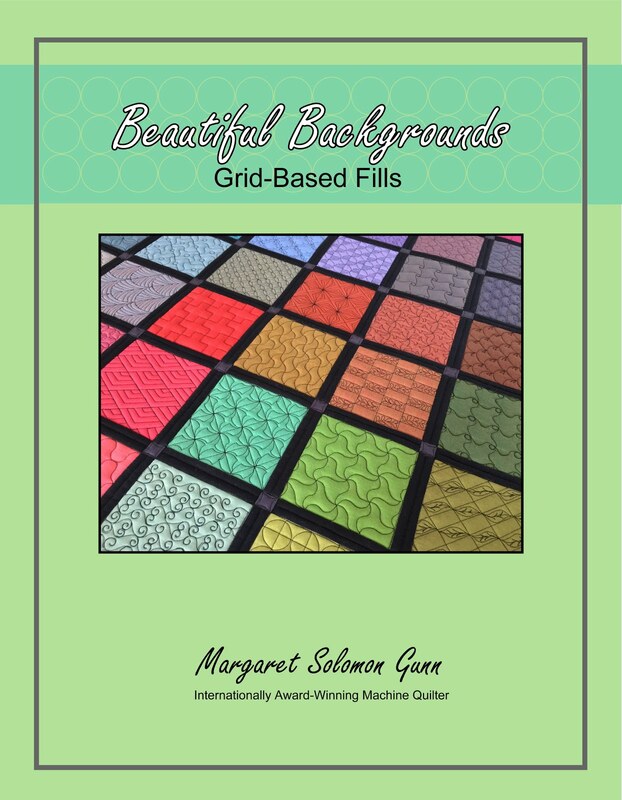 Here's a glimpse at the Innovative piecing category. I do like the double wedding ring a lot. It has me thinking about taking this quilt off of my bucket list. Innovative applique... "Hurricane" (below) is awesome and I think it was 1st place. This is the Best of Show. It is probably not what you were expecting to see...It's by Nancy Prince, quilted by Linda French. Nancy said it had 75000 yards of thread in the figures. They are thread-painted, and then added to the background. The detail she put into the people/animals was really amazing. Here's another interesting exhibit...there were over 2000 star blocks collected in honor of an astronaut/quilter Karen Nyberg, who was on the space station. They were put together into a sea of quilts - over 20-25 probably! Here are a few from the Frances Benton exhibit. 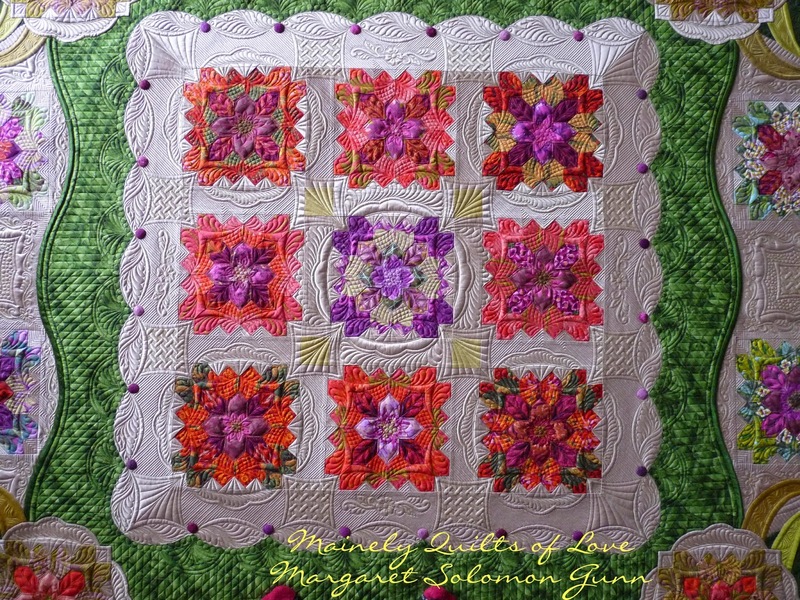 She passed away a few years ago, leaving more than a dozen applique tops to IQA. This year they got several finished. I did the middle one on this row. They didn't block the silly quilt, so it is hangs kind of wonky. Oh well! You can look back to sometime like May or June of this year for my closeups. 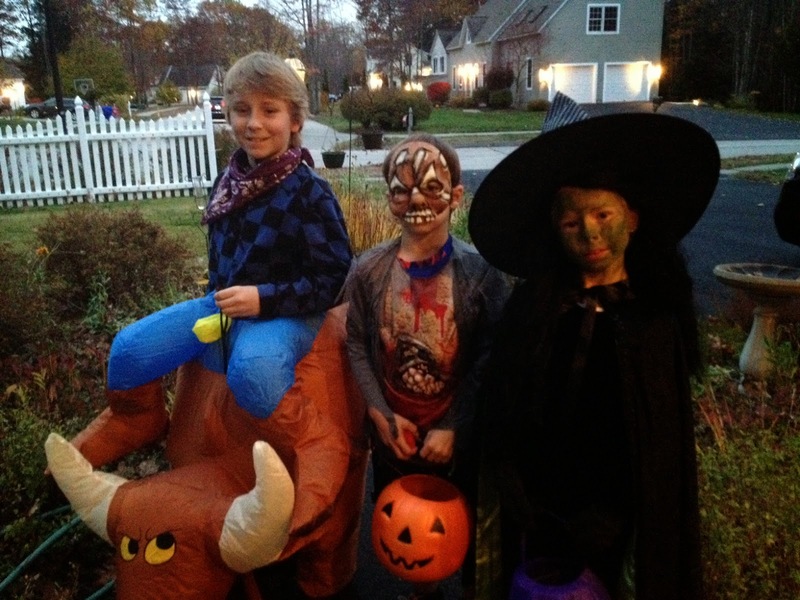 I flew home on Halloween so I could take my three little gouls trick-or-treating. It is definitely back to the real world...trying to prioritize the quilts to be done. 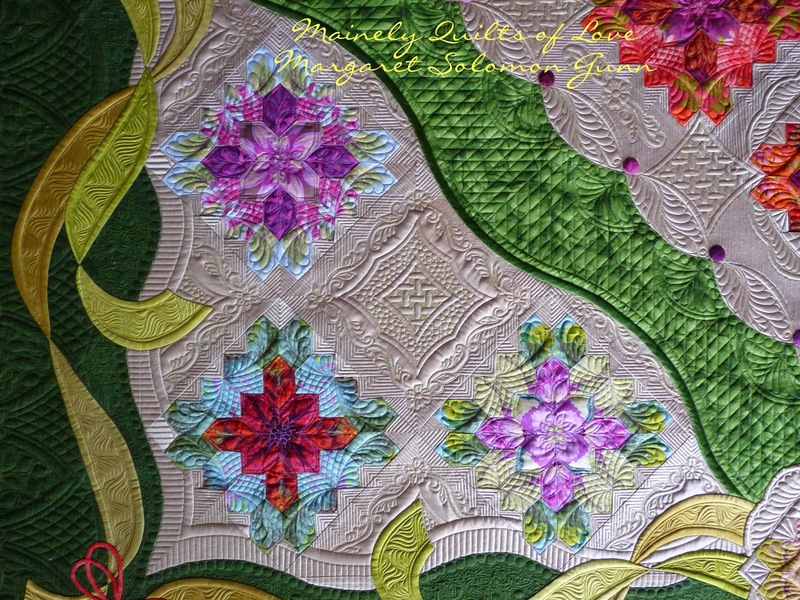 I have several Christmas deliveries to get quilting on, as well as actually getting my own 2015 show quilts DONE.